Male butterflies show a preference for females that have similar markings. MALE BUTTERFLIES HAVE genes which give them a sexual reference for a partner that looks like them, according to new research. 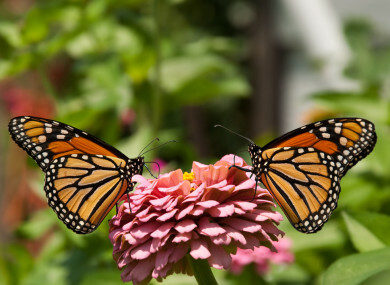 In a study published in the open-access journal PLOS Biology, a team of academics from the University of Cambridge, in collaboration with the Smithsonian Tropical Research Institute in Panama, observed the courtship rituals and sequenced the DNA from nearly 300 butterflies to find out how much of the genome was responsible for their mating behavior. This is one of the first ever genome studies to look at butterfly behavior and researchers said it unlocks the secrets of evolution to help explain how new species are formed. The scientists sequenced the DNA from two different species of Heliconius butterflies which live either side of the Andes mountains in Colombia. Heliconians have evolved to produce their own cyanide which makes them highly poisonous and they have distinct and brightly colored wings which act as a warning to would-be predators. Professor Chris Jiggins of the University of Cambridge, one of the lead authors on the paper, said: “There has previously been lots of research done on finding genes for things like color patterns on the butterfly wing, but it’s been more difficult to locate the genes that underlie changes in behaviour. What we found was surprisingly simple – three regions of the genome explain a lot of their behaviours. There’s a small region of the genome that has some very big effects. Email “Butterflies are genetically wired to choose a mate that looks just like them”. Feedback on “Butterflies are genetically wired to choose a mate that looks just like them”.